Hair Trends: The Reverse Braid and Other Insider Tips Courtesy of Redken and Guido | Fashion. Style. Beauty. | Life is short. Live well. I attended a fabulous event where a few of us beauty bloggers got a chance to sit with the legendary hairstylist Guido (he of multiple fashion shows around the world) and hear his take on runway and hairstyling trends courtesy of Redken. Charming and effusive, he really let it go and gave us some fun insight into what it’s like to work with the legendary designers and their runway shows. Out of the conversation came a huge trend that you’ll see in multiple magazines and on the street soon if you haven’t already: the “reverse” or “fishtail” braid. Created as the look for Alexander Wang’s genius Spring/Summer 2010 presentation and then seen again on the ADAM runway for A/W 2010, it’s a new and effortless take on a classically girly look. 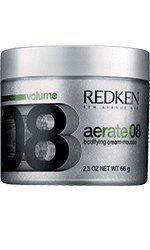 Creating the look is incredibly simple and he suggests using Redken Aerate 08 Bodifying Cream-Mousse to give the hair some lift and to create lightweight hold (and since this recommendation comes from using the product on the runway and in photo shoots, it’s been tested, believe me.) Simply reverse the direction of your hands when you braid your hair (as in, instead of tucking inward, pull and weave the hair in the opposite direction) starting at the nape of your neck and secure with a clear elastic. It’s edgy and runway chic and should take about three minutes. Redken products are available via a fine salon near you, so pick up this fabulous styling product and give the reverse braid a whirl. Runway walk completely optional.